First off, some unfinished business regarding yesterday's double-mug. This piece of pottery was on display at the Chapin Mesa Archaeological Museum at Mesa Verde National Park. Very few of these mugs have been found (according to the little plaque in the picture), but we do know that the bottom connector is open, meaning the level of liquid in the cup(s) remains equal. My suggestion is that it had some ritualistic function, most likely tied to marriage ceremonies, based on its similarity to "traditional" wedding vases (see below). Again, I ask for help from the anthropologists, as I couldn't find any reliable information on the actual "tradition" associated with these vases. But in general (across cultures), vessels such as the wedding vase with two distinct chambers/spouts/cups that are joined together are symbolic of marriage relationships and often serve ritual functions. 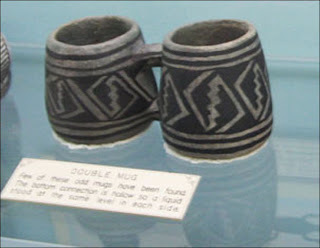 It makes sense to me that a vessel such as the double-mug could be intended for sharing between a bride and groom, perhaps as a means of finalizing their marriage. If you imagine for a moment that they were intended to drink from the cup together, in unison, they would have to drink cheek-to-cheek. Sounds romantic. Oh, and it's okay to use your imagination when you're thinking archaeologically. I know because Eli, our Interpretive Ranger who took us on a tour of Balcony House at MV, told us so. He said it's important to use our imaginations to put together the whole picture from the pieces that are left behind. He also told us that you can't generally get water out of cactuses, but you can get water from the little furry critters you bop over the head and eat, and hydration is key, and you really shouldn't touch the ruins in the cliff dwellings, and stay away from that ledge, and HEY-YOU! QUIT CLIMBING ON THAT PUEBLO!!! That's enough of that though. Please share your thoughts on double-mug in the comments section. Spent a couple hours in the studio last night. Mostly throwing cups. A baker's dozen. I'm thinking that most of them will work out for me, once they are trimmed/dried. If not, I'm not afraid to toss them in the slop bucket. Yup, I'm that intense. I also remembered to take some pictures of Sunday throws. So, here's the pictures and I'm done for the day. Have a great one! Bowls, slipped. Small (bottom) and smaller (top). Cups. 13. Some variation, but predominately uniform. Especially factoring trimming, etc. *For those not aware, archaeology is actually a subdiscipline in the field of anthropology. The other subdisciplines include: linguistic anthropology, physical (or biological) anthropology, and cultural anthropology. And, contrary to popular belief, none of these fields have anything whatsoever to do with dinosaurs. That would be paleontology. Obviously. My comment is: I love you a ridiculous amount. And, I was reading on-line and thought this was interesting "Corrugated ware was used mostly for cooking and storage; the elaborately decorated black-on-white ware may have had ceremonial as well as everyday uses. Women were the potters of the community. Their designs tend to be personal and local and were probably passed down from mother to daughter." Krystal - definitely an interesting piece of research. It makes sense that the more heavily decorated work was ceremonial or ritualistic, and that's why it's still around: it was used less often, and thus rarely shattered on the kitchen floors. and I love you, too. Emily - I'm glad to know that there is a fall-back answer for the unexplainable. I'm also glad that my declaration of it as ceremonial is in line with said answer. PS I love you too, and your blog made me smile tonight. After my day today, I needed that!! And that is supposed to say "How their mouths SAY they feel" oops...long day! guess it works either way...really really long day...! Two possible answers from a wizened coffee drinker. There are days when you both need to drink coffee and dump it on your head. Also, just because I don't know of anyone with two mouths and an horizontally elongated head, that doesn't mean they never existed.